Once you know the story of Heinz-Wolfgang Schnaufer, it’s pretty hard to forget. Schnaufer was an incredibly skilled pilot. He was arguably one of the best fighter pilots in the war. He also survived the whole war and only met his death when he crashed his car while on his way to purchase wine in Bordeaux. What more, Schnaufer accomplished this feat in only 164 operational sorties over a three year period. If he had been a professional sportsman, the pilot would have been in a Hall of Famer without any shadow of a doubt. All of the German’s victories were claimed at night, and the majority of them were British four-engined bombers. Schnaufer was awarded the Knight’s Cross of the Iron Cross with Oak Leaves, Swords, and Diamonds and given the nickname The Spook of St. Trond for his fighting prowess. He was one of 27 men in the whole of the Nazi fighting machine to have received the prestigious award, which was the highest fighting honour Adolf Hitler could bestow upon the men he sent to fight. By the end of the conflict, Schnaufer’s crew had all been awarded the Knight’s Cross of the Iron Cross – a unique distinction. The pilot was born on the 16th of February in 1922 near Stuttgart and originally learned how to fly in a glider as a member of the Nationalpolitische Lehranstalt in Potsdam before the outbreak of the war and joined the Luftwaffe as a trainee officer-pilot in November 1939. 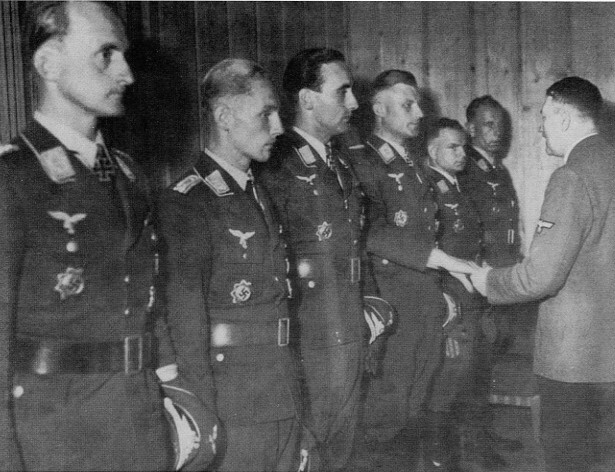 Friedrich Lang, Erich Hartmann and Heinz-Wolfgang Schnaufer receive the Oak Leaves with Swords, Horst Kaubisch, Eduard Skrzipek and Adolf Glunz the Oak Leaves to the Knight’s Cross from Adolf Hitler. It took Schnaufer two more years before he was promoted up to the rank of Leutnant while he underwent training to fly multi-engine airplanes – and begun learning the fine art of fighting at night and he began fighting in January 1942. While the pilot’s training and his road to combat might have been long and winding, his introduction to British bombers certainly didn’t take as long. Schnaufer spent three years preparing for the fight, and it was nearly all so different as his plane was hit by return fire and the German was wounded in the leg shortly after claiming his first kill. 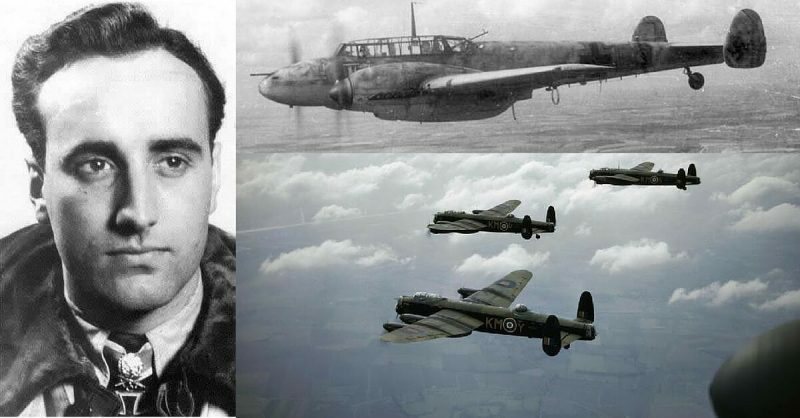 The Allies wouldn’t get a second chance to put down the talented man, who wouldn’t be wounded in aerial combat for the rest of his career and by the end of the year Schnaufer would claim seven kills – two Halifaxes, one Lancaster, four Wellingtons and one Whitley. Some pilots would have been happy with claiming seven in half a year, but Schnaufer was just getting started, and success came quickly for the youngster, and he was promoted to Oberleutnant in July 1943 after claiming 17 bombers shot down. The 20th victory for Schnaufer would come in the early hours of the 9th of July 1943 as he shot down a Lancaster bomber that belonged to the 49 Squadron at 2:33 am near Grobbendonk, Belgium. Shortly after this, the German was transferred to Leeuwarden in Holland and was appointed Steffelkapitan of the Nachtjagdgeschwader 1 on the 13th of August 1943. It would be a further two months before the Ace recorded his 30th kill, but by December he had raced up to 42 and was awarded the Ritterkreuz.